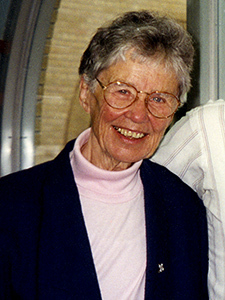 Sister Marie Stephen Reges, O.P. (née Mary Louise Reges) was born on March 27, 1915 to George and Mary (Gately) Reges in Washington, D.C. She attended Sacred Heart Academy in Washington, D.C. for grade school through high school. She received a B.A. in Mathematics from Trinity College, Washington D.C. in 1937, an M.A. in Mathematics from Catholic University, Washington D.C. in 1938, an M.A. in Theology from Providence College in Washington, D.C. in 1950, an M.A. in Religious Guidance from Providence College in 1953, and an M.A. in Hebrew and Semitic Studies from UW Madison in 1970. Sister Marie Stephen (affectionately known as “Sister Stevie”) taught at Trinity High School and Rosary College in River Forest, Illinois. She taught at Edgewood College in Madison, Wisconsin for 35 years, where she initiated its major in mathematics. While serving as Theology Professor at Edgewood College, she became Chairperson for the Philosophy and Theology Department and led the effort to create the Religious Studies Department. She devoted much of her life to fostering Jewish-Christian dialogue in Madison. In recognition of her many good works for the college, she received the first Sister Stevie Award which was established in 1987. Since then, Edgewood College annually bestows the Sister Stevie Award to a staff or faculty member who exemplifies the college’s mission and spirit. Sister Marie Stephen also had a great love of fishing at her favorite spot on Lake Wingra near Mazuchelli Hall. Her personal bookplate depicts her in profile, veil on her head, fishing pole in her hand. Sister Marie Stephen died on May 25 1997, at St. Dominic Villa, Sinsinawa, Wisconsin.